Logistics investment will remain strong in key Western European countries but economic condintions create value in the East. ■ In 2014, property investors turned their attention to the logistics market with investment volumes in the UK rising 54% to reach £4.2 billion the highest year on record. 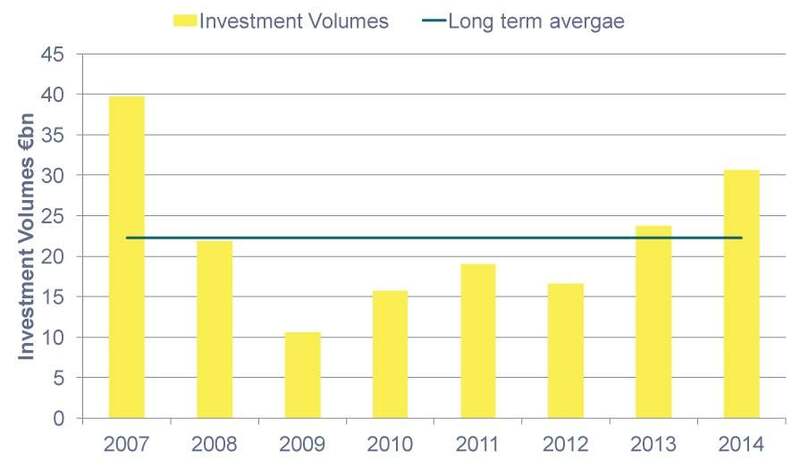 Whilst in Europe volumes rose almost 29% to €30 billion, almost reaching the record volumes of 2007, and above the long term average of €22.2 billion per year. ■ Investors were attracted to logistics for a combination of reasons, including the tendency to secure long term leases to strong tenants. Also, more than any other asset class logistics is a cross border operation. Fashion retailer ASOS serves customers globally from a warehouse in Barnsley in the North of England and John Lewis serves 170 different countries from their units in Milton Keynes in the South East of England. There are also countless examples of retailers serving Southern Europe and the Balkans from large warehouses in Central European markets such as Poland or the Czech republic. ■ The underlying structural driver in this demand in the exponential explosion of online retailing and the consequences for global supply chains which are resulting in new logistics space being required. In 2013, Savills research predicted that 50 million sq ft of industrial property will be required, in the UK, to match the needs of the sector and Prologis have stated that for every €1 billion increase in online sales requires an additional 72,000 sq m (775,000 sq ft). 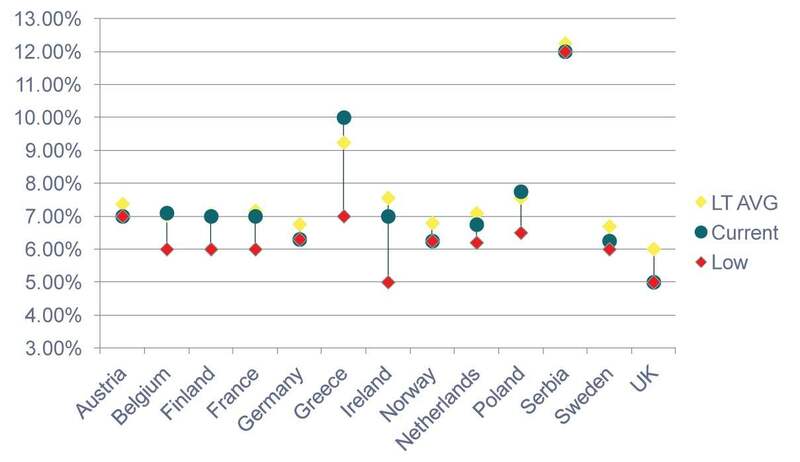 ■ Whilst the assumption would be that take up would be concentrated on large units in the centres of countries and continents, there has also been a surge in take up for smaller units for parcel delivery companies on the edge of conurbations as occupiers struggle to get to grips with last mile delivery and the associated urban logistics. ■ Moreover, online retail has created another issue which requires an emerging property asset class: the returns centre. Some reports suggest that up to 40% of product ordered online is subsequently returned to the retailer. Large retailers need to create order from this chaos before the stock can be returned into the supply chain and resold. Whilst this is an immature industry at the moment it seems that the current trend is for retailers to take extra warehouse space. ■ With European online retail forecast to be worth €233.9 billion (£189.6 billion), up from €112 billion (£81.1 billion), by 2018 according to a recent study from Forrester, it is clear the demand for logistics space across Europe will be set to rise even further. ■ Indeed, based upon the Prologis assumptions and the European forecasts for online retail growth at least 94m sq ft of logistics property will be required by 2020. ■ Occupier demand in the logistics sector is driven by key structural change such as the evolution of online retail, retail consolidation and the drive for the major food retailers to service customers in different ways. However, cyclical changes in occupier demand are more in line with the economic cycle, how economies are performing global trade flows. These factors, combined with structural changes will help identify future European growth spots for logistics in the coming years. 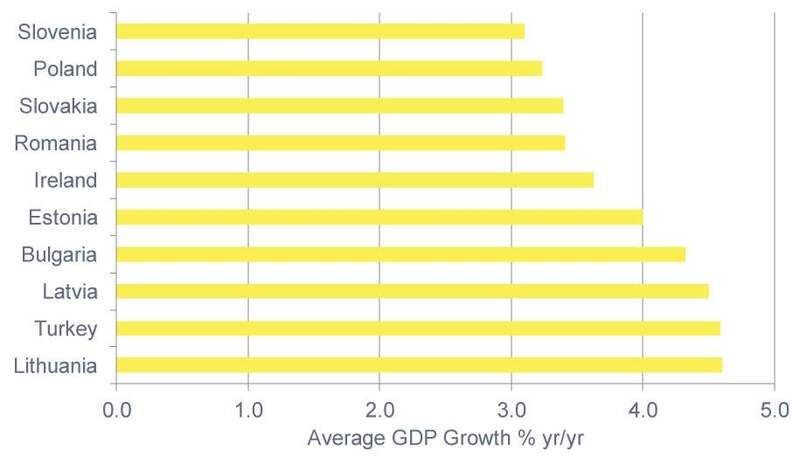 ■ Within the EU area, the average annual GDP growth forecast for the next five years is 1.9%. However, the range of growth forecasts between countries is between 1.0% average growth per annum in Italy to 4.6% in Lithuania. Interestingly, nine out of the top 10 countries for GDP growth forecasts are in Eastern and Southern Europe, aside from the Republic of Ireland. ■ The retail market will also be a strong driver for growth in the logistics sector and again the same trend emerges when examining retail sales growth forecasts with 8 of the top 10 countries classified as within Eastern or Southern Europe. Bulgaria tops the table with annual growth forecasts of 5.0% per year, and also sits within the top 5 for GDP growth. 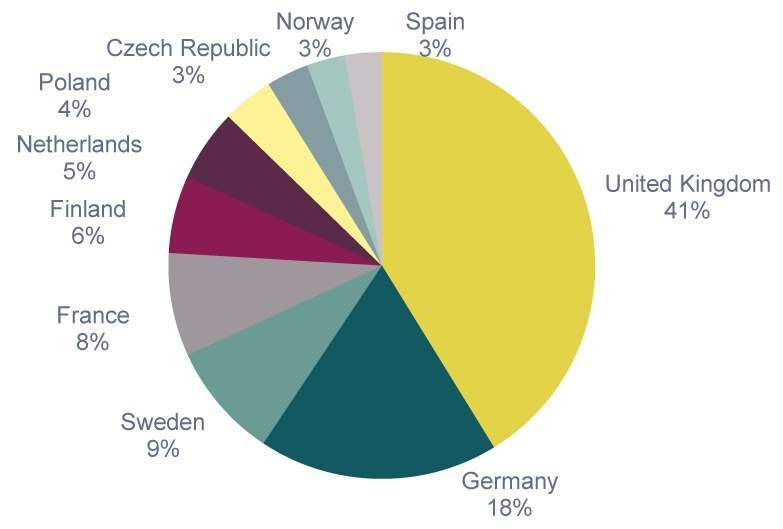 ■ Examining all investment into European Industrial markets shows a vast dominance of the established Western economies in terms of logistics investment with the UK and Germany accounting for 54% of all investment volumes in 2014, according to data from RCA. Of the top 10 counties targeted by foreign investors only two, Poland and Czech Republic, make the top 10 of transactional volumes. ■ Whilst the dominance of the major European population centre’s such as the UK, Germany and France will not be challenged in terms of the logistics investment in the short term a case can be made for investors to look beyond these markets. ■ Economic growth, resulting in retail sales growth will result in greater demand on logistics facilities in Central and Eastern Europe. Retailers will need to adapt their supply chains and online sales will start to have the structural impact on the market it has had in the UK and Germany. 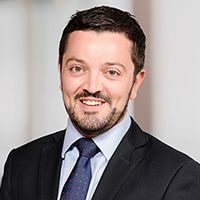 Therefore markets where investment volumes are currently low and growth is forecast such as Bulgaria, Romania and the Baltic countries could offer investors an alternative entry point to the European Logistics market compared to other stock starved markets.